The Atlantis astronauts used a less-capable backup sensor system to inspect the shuttle's carbon composite nose cap and wing leading edge panels today after an overly-tight cable prevented them from using a more sophisticated, steerable sensor package. The crew lost several hours troubleshooting the problem, but the lead flight director said he was confident all the necessary data would be collected when all was said and done. "We've got some of the best engineers and imagery analysts on the planet supporting Atlantis," Mike Sarafin told reporters Saturday afternoon. "I'm confident that given a little bit of time, we'll come up with a solution that will cover the entire heat shield on Atlantis and we'll get there well in advance of when a decision is required to bring her home. We just need to give that process a little bit of time ... I'll bet you given a day, things will come together very quickly." Space station flight controllers, meanwhile, continued to track a piece of unidentified space debris in a highly elliptical orbit that was projected to pass within about 6 miles of the space station shortly after Atlantis' planned docking Sunday around 10:27 a.m. EDT. Engineers were considering a rocket firing Saturday evening to lower the station's altitude by about 3,000 feet to eliminate any chance of a close encounter. "We're kind of cutting it close as to whether we can dock and get structurally mated to the International Space Station and then into the docked attitude relative to this debris avoidance maneuver," Sarafin said. "We really can't get confident that if we need to get out of the way of this piece of space debris we'll be able to do that after the shuttle docks, just due to the timeline. Given the five-mile-per-second orbital velocity of the space station, "just a small error in the amount of time we determine where something is could make a big difference in your total miss distance," Sarafin said. "A couple of seconds at that speed could mean you'd miss by a huge amount or you'd miss by a very little distance. That's being factored into the debris avoidance maneuver plan." A decision on whether or not to maneuver the station was expected around 6 p.m.
As usual for post-Columbia shuttle missions, the Atlantis astronauts faced a busy second day in space Saturday with the heat shield inspection the most time-consuming activity. The idea was to scan the nose cap and leading edge panels, which experience the most heat during re-entry, with a steerable laser and camera system on the end of a 50-foot-long boom attached to the shuttle's robot arm. But a cable interference issue prevented the sensor system's pan-and-tilt unit from working properly. "We determined that we had quite literally run into a snag with the gimbal system on the end of the boom," Sarafin said. "One of the cables on the end of the boom is pulling taut and causing us to not be able to tilt our primary camera system fully up, which is affecting our ability to see all of the heat shield on Atlantis. "So what we've done is, we've gone to a secondary mode, which is a different camera, it's a digital camera that is hard mounted to the boom, it doesn't sit on this pan-and-tilt unit, and we're proceeding with the inspection of the starboard wing, we completed that earlier today, we're currently in the process of scanning the nose cap and we expect to get the majority of the port wing later." 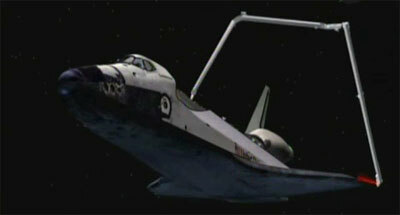 The secondary system can only be used during the daylight portions of each orbit and it was not clear whether the crew would be able to complete the inspection of the shuttle's left wing by the end of the day. To fill in any gaps, station astronaut Tracy Caldwell Dyson plans to use a digital camera equipped with a powerful telephoto lens to photograph the parts of the left wing's leading edge during Atlantis' approach to the station Sunday. Positioned 600 feet directly below the station, commander Ken Ham plans to guide Atlantis through a 360-degree back-flip maneuver to expose the shuttle's heat shield tiles to view. Station commander Oleg Kotov, Soichi Noguchi and Timothy Creamer already planned to photograph the shuttle's heat shield tiles from the station. Caldwell Dyson now will join them to photograph the left wing's leading edge panels. "Once we get all that imagery on the ground, the team will determine if we need to go get additional information or views of Atlantis before we're ready to declare the heat shield ready to go or if we've got al of what we need," Sarafin said. A block of time is available on flight day five for an additional "focused" inspection if necessary.